With spring football officially underway and the Oregon spring game is less than a month away, Duck fans can rejoice, football is back. Every year, fans almost fill Autzen Stadium to watch their Ducks for the first time since the season ended. The Spring Game brings a lot of good to Eugene, but one tradition stands above the rest. 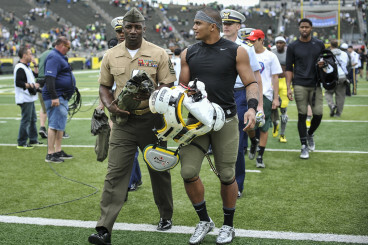 Thomas Tyner exchanges words with a service member following the 2014 spring game. For the past five years, the University of Oregon, with help from Nike, has created special uniforms for the athletes to wear during the Spring scrimmage. But what makes these uniforms great is that they honor each branch of the United States Armed Forces, and last year, the jerseys read “Salute The Day” in place of the players names, a one-off of Oregon’s motto “Win The Day.” Following the game, players give their jerseys to one of the roughly 100 service members in attendance and share some time with one another. Service members watch from the 50-yard line. With each branch of the military represented, Kelly has turned the game into something much more for the service members in attendance. 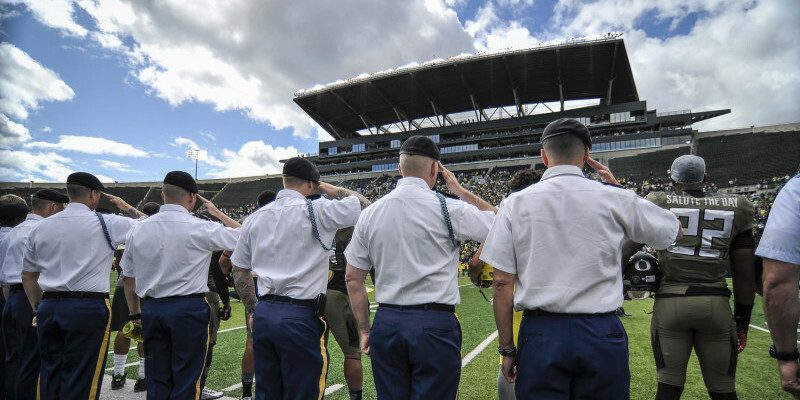 The men and women who serve our country get special seating at the 50-yard line, run out onto the field with the players and receive the game-worn jerseys off their backs. While many teams across the nation have spring games, few have been able to attach such a powerful meaning to the game like Oregon has. In addition to the military appreciation, admittance to the game is an encouraged donation of a non-perishable food item that helps boost donations to the local food bank, Food for Lane County. 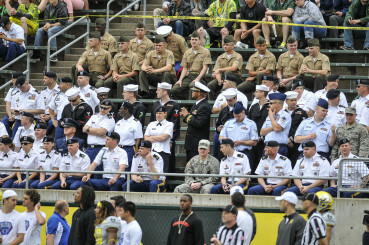 The Oregon Spring Game helps the community raise food for those in need while paying respect for all divisions of the United States Armed Forces – and, of course, gives us the much needed football we have all been waiting for. So bring some extra canned food, bring your Duck spirit, and support your troops at this year’s Spring Game on Saturday, May 2, at 11 a.m.